Having a Facebook page costs a lot of time and dedication, something every page administrator is aware of. Not only to create content, but especially to establish a community. A goal is that the page’s followers like, and in the best-case scenario join the conversation and share the post. Unfortunately most posts aren’t as successful as you wish they were, but why and what can you do to change that? The most important variable is the fan. First off, as a page administrator you need to realize why people use Facebook. We are talking about normal people who browse Facebook in their spare time, not about professional online marketing managers or something like this. We start with a simple experiment and ask ourselves: Why is the average user browsing Facebook? B) Because he got a message or an invitation? C) Because he needs something to distract himself from work? D) Because he specifically wants to know what products for instance Walmart is selling at the moment? Of all answers D) is the most unlikely one. Sure, it’s possible that there are people who browse pages to find discounts and product information, but that’s just a small group of users. The majority wants to waste time. It’s like window-shopping. Look around, see some nice stuff but don’t fully commit to it. They simply want to be entertained. Most page administrators ignore this simple and somewhat obvious concept. If you want to interact with your fans it is necessary to give them something they can hold on to, something that makes the post interesting. Otherwise the content will be ignored or maybe even seen as annoying. Emotional posts are all posts that grant the user emotional experience. It doesn’t mean that it has to be Cat-Content. Brands can make their fans laugh and root for them as good as anyone else on Facebook. Posts that are informational explain or simply tell the fan something he didn’t know yet. A page can easily help their supporters to become smarter and better-informed people. Promotion posts present the opportunity for a fan to win, save or experience something special. They give fans access to something they usually wouldn’t get access to. This can be a lottery, invitation to an event or simply a discount for products. 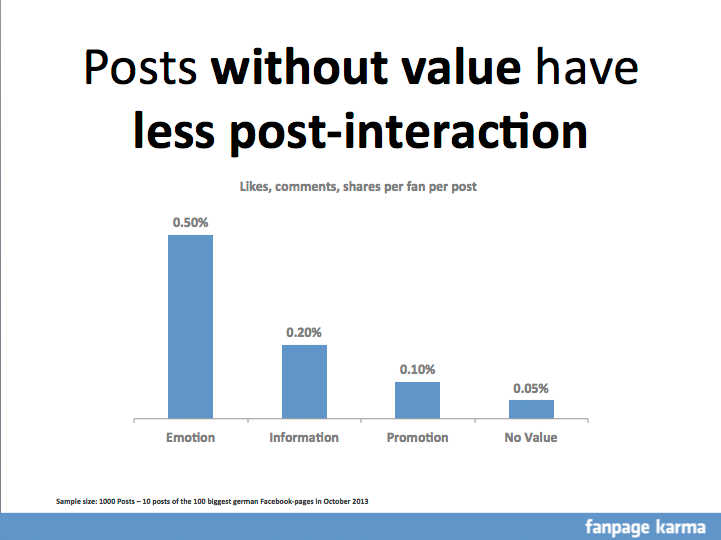 A posts value directly influences the interaction. We analyzed posts of the 100 biggest Facebook pages and categorized them by Emotion, Information, Promotion and added the category no value. The result is pretty clear. Posts without any value get way less feedback than the ones that do. As you know feedback is the most important thing when trying to reach more and more people. Emotional posts end up being the best. In comparison to posts without any value they generate ten times more interactions, which is quite an impressive figure. Informational posts come in second, promotion posts third. Surprisingly, promotion posts only get twice as many reactions as posts without any value. A simple explanation for it is the fact that simple discounts are part of this category and not every Facebook promotion gets as much feedback as you’d expect. Posts can increase a company’s popularity and improve their image or simply make people aware of their existence. A brand doesn’t need to be represented by its product; it can also be customers, employees or a good-looking face. Other posts simply are supposed to guide people onto the company’s blog, Pinterest or even an online shop. Their main purpose is to generate traffic, using links or pictures. The goal is to make the fan look at non-Facebook content. Last but not least it’s possible to make a page part of the company’s customer-support by answering questions and helping your community with occurring problems. To be successful a post needs to find its place in our utility-matrix. The utility-matrix has an additional column named figure-makeover. Part of this category are all posts that don’t have a clear value for the page and are published to generate interaction and make the page look better than it is. 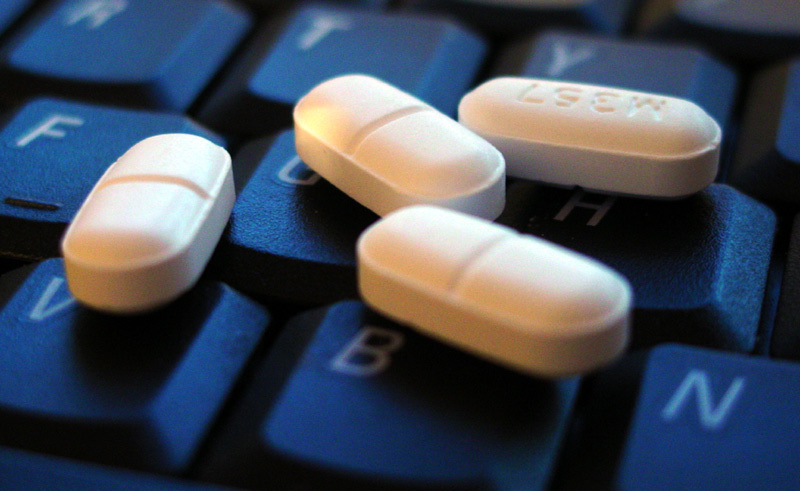 Be it to trick Facebook’s newsfeed-algorithm or to comfort your boss or clients. A post that fit neither category is useless to both groups. The utility-matrix also helps with planning campaigns or business strategies. You need to ask yourself: In which categories can I deliver good content? Do I have the required resources to preserve a high post quality? Or should I even consider a completely different medium and leave Facebook behind? If these questions are answered it’s necessary to find out which kind of content is worth to begin with. A second matrix helps you to figure out which topics bring the highest value for your users. Product posts are all the posts that have to do with a company’s product and the product’s features. On a celebrity’s page the product obviously are posts about him or her. Posts that focus on the pages fans can be anything from saying thank you for the support to publishing user submitted content. The history of a company or posts about its employees and for example philosophies are categorized as well. Basically anything that is about the company behind the product can be considered as a company post. Industry posts on the other hand don’t focus on the supporters of a specific page but rather on a fan-group that consists of people who share interests. To give some short examples: car brands can announce an exhibition or a producer of sportswear posts videos of sponsored teams winning championships. The important thing is that the post is directly related to the page’s industry. General posts are everything else: Talking about the weather or Christmas or anything else that doesn’t fit one of the other categories. 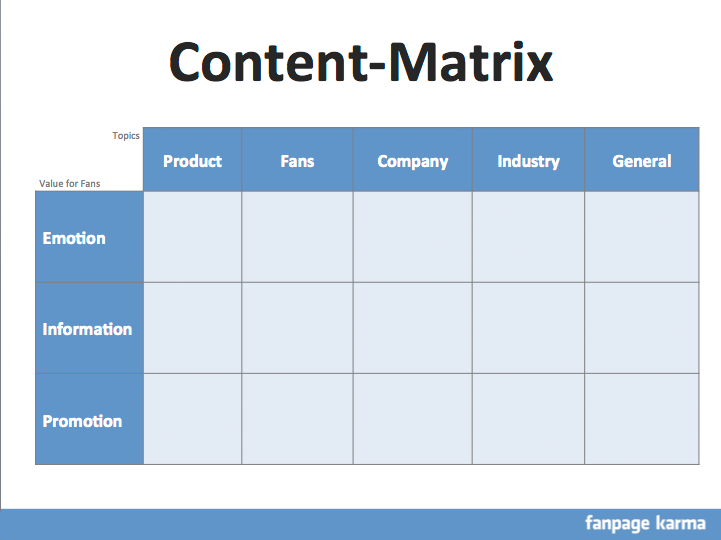 If we combine the five topics with the three values we end up with a useful tool to plan content: our Content-Matrix. Page administrators can cross out fields if they don’t feel like being able to deliver high quality content or simply use it to figure out what they would like to specialize in to begin with. It can also be used for already existing Facebook pages. Analyzing past posts shows which content usually ends up being successful and tells a lot about fan-behavior and what they are interested in. Detecting what fields are worth investing more time into or analyzing competitors are two other useful qualities of the matrix. 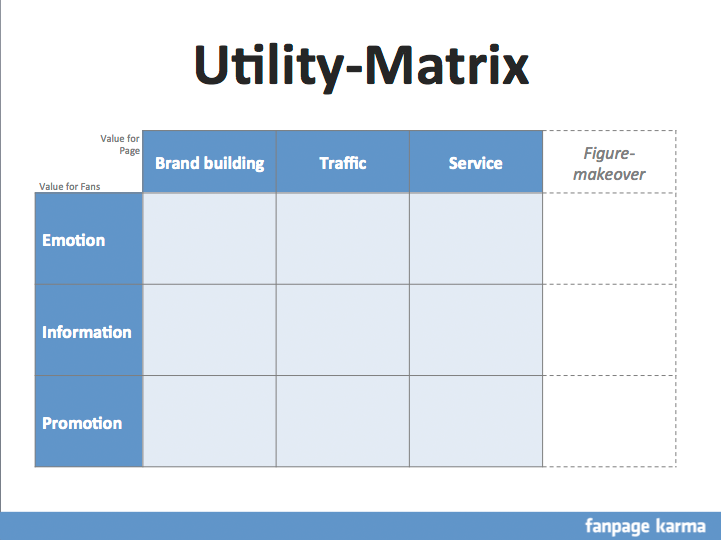 The Utility- and Content-Matrix are two useful tools (Download the .pdf here) to understand what is going on and how to make posts more successful. If posts have clear values for all participants a fruitful relationship can be build and a dialogue be created. The focus always lies on the fan. A good way to express this concept would be: LSD. Not for the community manager though, just for the posts. LSD stands for Laugh, Save, Discover. It obviously resembles the three categories that we have presented earlier: Emotion, Promotion and Information. Ask yourself whether a fan can laugh, save or learn something from the content you’re about to post before hitting send and you already made a big step into the right direction. As a hint: Go over your own posts and see what category works for you or your competitors. That way you can start to analyze which posts work best, have potential to work better and from which content you should stay away. Just use our Tagging-Feature.